This book will have different appeal depending. Dry, scholarly, be warned, but fascinating. I am not a researcher in the field so I tended to skim the book. If anything, this increased my respect for ancient Egyptian art. They had a complete system for encoding three dimensional objects in two dimensions without perspective in order to enhance the two dimensional decorative patterns. They portrayed the most typical view of each part, combining them in a seamless way, which reminds one of Cubism. If a god (or king etc.) normally held a scepter in the right hand, they would portray the god that way if the god was facing right. They identified right with forward. Sometimes, they would put a figure facing "backwards", to the left, to add rhythm. If the same god were facing left, the god would be effectively mirror imaged, yet the scepter would still be in the right hand but it would be attached to the left arm. So the spatial logic of the scene, and the way that right/forward left/back was encoded in Egyptian art would trump the side of the hand that had the thumb in real life. And I am sure that most artists were aware of this, and it bothered them no more than blueprint of a building bothers us. In temples the work was usually completed. But in tombs the heirs usually stopped work when uncle Anentahiptohop dropped dead, since they needed to use the tomb, and they wanted to have something left of the estate. Anyway, because the work is incomplete, they can see the way that the work is laid out in tombs. There is a grid system for organizing and relating the major figures. It's sort of like the heads system in western life drawing--they just don't try to cover every possible situation at any possible angle like we do, anyway that would defeat the purpose of harmonizing everything in the plane. This mostly applies to the major figures. Minor figures were almost invariably drawn freehand. Also, they relaxed almost all of the canon in depicting battles, since these were supposed to portray conflict. Not exactly a waste as it has a good selection of quotes, and I agree that there is a creative force (in my opinion) inside of yourself that you can plug into, I didn't find this too helpful. I have noticed that the preponderance of books on creativity are focused on getting unblocked. This is extremely helpful for those who are. However I think such books to be worthwhile to a general audience need to dig a little deeper and go into ways to sustain creative growth once you get started. The focus is primarily focused on a recovery model, with quirky suggestions. I've noticed that writers on creativity tend to be writers, which sometimes introduces a bias. After many anecdotes about the heartbreaking world of screenwriting the author will often catch herself and say effectively oh yeah and that goes for you painters and folks like that too. Although good, I do not understand why it has the reputation it has. I will be having a one man show of my paintings at the Santa Cruz Art League, in the lobby. The show will run concurrently with the Local Essence show, Feb. 12 to Mar. 6, 2011 in the main gallery. I will also have a piece in the Local Essence show. As a general note, I am very pleased with the care Taschen puts into their art books. The book gave a very good precis of Rothko's life in a small volume. This is a slim and affordable book, but the illustrations are incredibly well chosen, and the color printing is just fabulous. The version I bought was a trade paperback. With Rothko's work, much relies on subtle flutterings of hue and value and luminous variations of nearly monochrome fields, and merely good illustrations would lose so much. The selections give a good representation of Rothko's work, especially his signature style, and enough of his earlier work to give a good flavor of his development. If I were rating just the color reproductions I would give it 5 stars. This had very good illustrations, which you expect in a large "art book". The quality of these is one of the essential ingredients, and the color was pretty good. I found myself concentrating on the illustrations rather than the text, The text did go into considerable detail about his symbolism. This book contends that the Franciscan world view was not that pervasive in the counter reformation, and therefore the Caravaggian naturalism with its undercurrent of street emotion and underclass was not what the Counter Reformation had in mind about making the lives of the saints real. Using ordinary life was actually taken by many as irreverent. 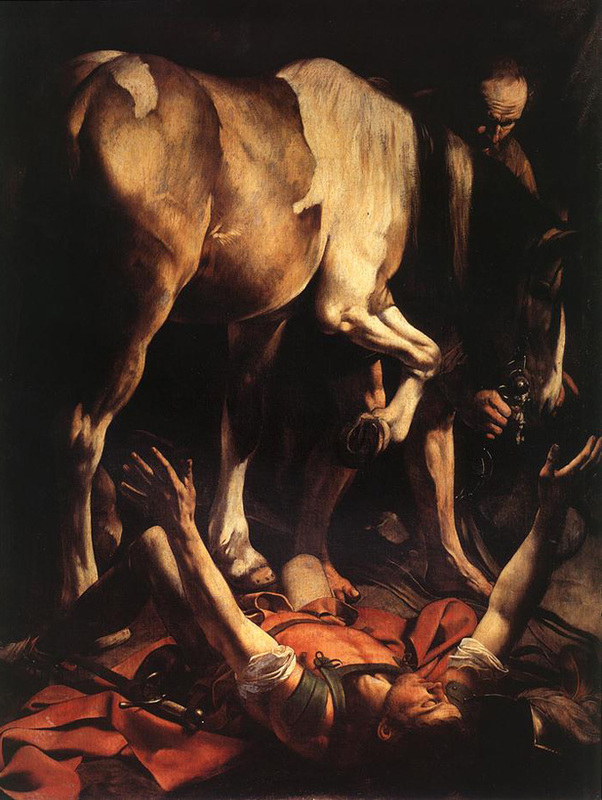 The other volume, while conceding that Caravaggio had an unhealthy fixation on beheading, and was heck, a little mentally unstable, wanted to stress his orthodoxy in a way that made many of the contemporary criticism of his style incomprehensible. So in essence the two books take diametrically opposite positions as to whether his painting style was following though on the Vatican's contemporaneous positions on sacred art. I also have to confess I learned something about the symbolism of the Supper at Emmaus. Spike points out that the pose, and the beardlessness of Christ is an echo of the image in Michaelangelo's Last Judgement. The only real difference in the hands is that the right hand in thrusting toward the viewer. There is therefore a sense of judgement that overlays the scene, and, with that modification, also includes the spectator. The landlord or proprietor looks through him--he isn't there for him. The Disciples, on the other hand, react, are amazed. The author wrote with a definite slant, that was a bit odd. He is a Knight of Malta according to book cover, and that may explain a bit. He seems to cover three things (in addition to some minutia about the Knights of Malta) the violence and eccentricity, the patrons, and the religious feeling. Seems some special pleading to make him seem more orthodox. Not to much about the art per se. Almost zilch about his use of light to convey passion, and structure his paintings. And definitely not about Caravaggio's sexuality, except to insist over and over again that he was not gay or bisexual, in many cases that sound like special pleading. Like those who think he was seems less concerned with it than this author who seems to have wanted a "manly" Caravaggio (albeit very disturbed, proud and unhappy). True, there was a whole institution of circulars, avisos, that were the yellow press of the day, so there were definitely false rumors being spread all the time. 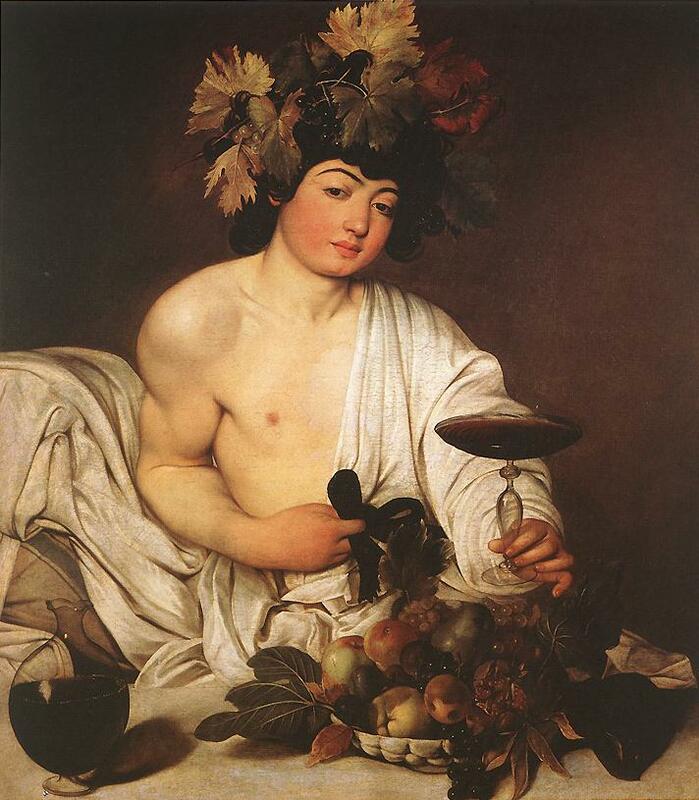 I guess that's no big deal, but the vibe given off by his Bacchus doesn't seem consistent with that interpretation. There are better sources about Caravaggio than this book. I was rather interested in the Malta angle. It is a fascinating place. And the Maltese language, which is like Arabic with a lot of its vocabulary coming from Italian (and English)--see the Wikipedia artical on the Maltese language. I am experimenting again with acrylic transfers. First, I prepared the canvas, covered it with tar gel. adding a few accents. I had some drawings on vellum tracing paper that I had used as preparatory sketches for a large (3'X6') drawing I had done. I went over these with charcoal, and transferred the charcoal drawings to the acrylic and removed the paper. In some places I just left the paper inside, covered it with acrylic medium and sanded. I allowed some chunks of charcoal to fall in and get crushed, as you can see in this detail. By the way, crushing charcol into acrylic tar gel under pressure holds great, without fixative. I used newsprint to cover the tracing paper so I could apply pressure without tearing. I allowed some newsprint to get transfered too. Periodically I am putting some medium on it and sanding it so that I can have an even surface to work on. I then took a flowered shirt and moved it as I scanned it to get interesting patterns and printed the scans. 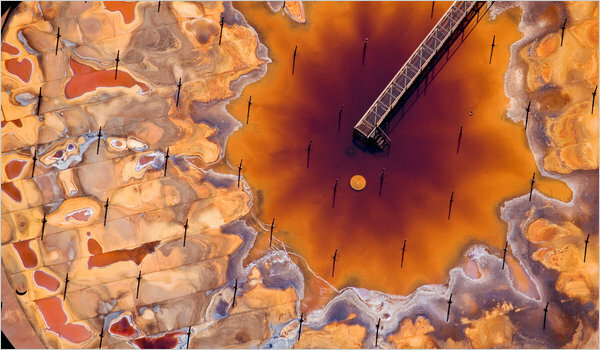 I then placed gel on the canvas for the new images to adhere. After they were somewhat dry I started to remove the paper again. After removing the paper, the imprint of the scanned shirt remains. Here you can see a detail with the red of the shirt, some newsprint, the earlier charcoal layer, the crushed charcoal, and a few brush strokes of off white acrylic. After that, I painted and sanded, sealed, and painted several times. I attended The Artist Everywhere Project and finished off the painting there. Imagine! A bunch of artists show up at a grocery store, set up their easels, and start painting! Anyway, here's the finished state, more or less. Oh don't get confused, I finally decided that this was the best orientation. I then sanded down the canvas to a point almost like it was before, did some light painting on it, and added some glazing.